From the wide open spaces, crisp air and dramatic landscape of New Zealand to the bustling city streets, bright neon lights and delicious food in Japan, the last couple of weeks have certainly been an adventure. As I sit here in my cosy hotel room in Kyoto with the rain softly falling on the Zen garden outside, I thought it would be a good idea to share some quick travel highlights of Tokyo. 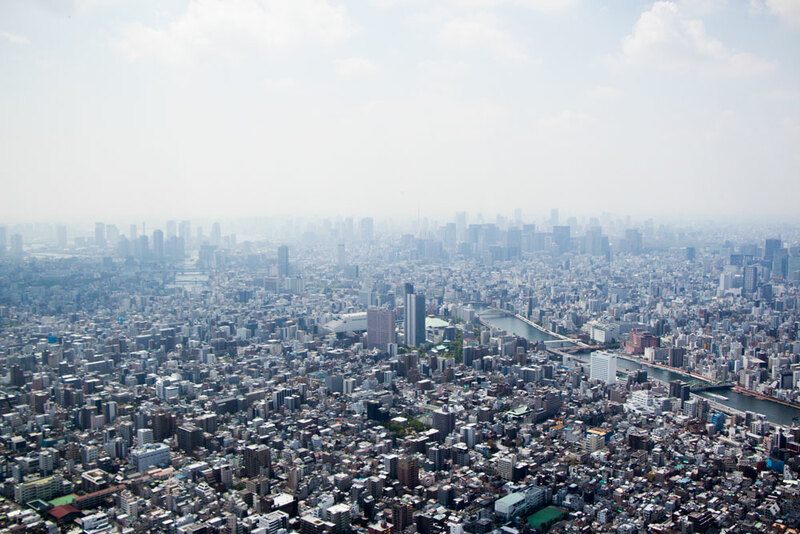 Tokyo is often referred to and thought of as a city, but is officially known as a ‘metropolitan prefecture’. With 35 million people (that’s more than the population of Australia! ), Tokyo is one of 47 prefectures in Japan. Equally wild and peaceful, its sheer size is outstanding. We spent four days in Tokyo and decided to start with a bird’s eye view from the Tokyo Sky Tree, with a 350 metre and 450 metre observatory deck offering 360 degree panoramic views of the city. Only a couple of days earlier, I had jumped out of a plane in Queenstown, New Zealand at 15,000 feet with STA Travel – but the height from the observatory deck at the Tokyo Sky Tree still made me dizzy! Following this, and over the course of the four days in Tokyo, we explored Asakusa, Sensoji Temple, Ueno Koen Park, Meiji Jingu Shrine, Shibuya, Roppongi, Shinjuku, Ginza, Kabikucho, Harujuku, Chidorigafuchi and Mt Takao-San. More on these destinations coming to Mr Weekender soon! The sounds At most train stations, you might catch the sound of chirping birds. Look around, and strangely you won’t actually see any birds. It seems the Japanese like to play the sound of chirping birds to keep people calm as they rush between platforms. The toilets The toilets are extremely futuristic. With automatic toilet seat lids, automatic flushes and heated seats – it makes for an interesting bathroom experience. Sitting on the toilet you might hear the sound of a waterfall. It took me a couple of days to realise this and its purpose – so other people in the bathroom don’t hear you. The cleaners Walking through Tokyo train station, you might hear a cleaner before you see the cleaner. Roaming around with bright blue machines cleaning the floors of the station, the machine plays a loud lullaby, on repeat. The queues The Japanese love queuing. They will queue for hours at a time to try something because it’s recommended, new or popular. The unspoken rule There is an unspoken rule in Tokyo (and Japan) not to talk on your phone on public transport, which is I love. It’s something I never do back home in Australia. The train sleep Stealing sleep on trains in Tokyo is mandatory. Everyone does it. And miraculously the Japanese never miss their station. And if you find your shoulder being used as a pillow for a tired Japanese person, just roll with it! The packaging The Japanese love their packaging. Everything is packaged beautifully and meticulously – even the little juice boxes and milk cartons in the convenience stores. The vending machines Vending machines are literally on every street corner selling varieties of drinks – but rarely snacks. The cinemas We went to the movies and everyone took their rubbish out of the cinema and gave it to the cinema employees outside the cinema. This is unheard of in Australia! The facemasks You will see a lot of Japanese wearing facemasks – but this is not to protect them from catching the flu. It’s because they have the flu and don’t want to give it to anyone else. The rice I love rice, a lot. And even more furikake, which is flavouring you sprinkle on top of rice, such as sesame seeds, chopped seaweed, sugar and salt. The plastic food Plastic food is big business in Tokyo and Japan all over. The Japanese spend lots of money investing in plastic food which are exact replicas of the meals they serve (well, kind of). The cafes and restaurants display the plastic food outside their restaurants to entice people to dine in.